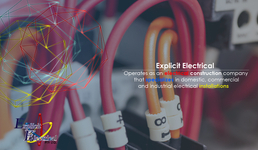 Explicit Electrical Pty Ltd operates as an electrical construction company that specializes in commercial and industrial electrical installations as well as specialized installations including alternative and renewable power installations. We also do routine maintenance on existing electrical installations. Explicit Electrical Pty Ltd also conducts electrical inspections and tests on behalf of the client to assure that the electrical installation complies with the minimum regulations and that the Certificate of Compliance “C.O.C.” is up-to-date and valid. Our goal and mission is simple. It is to be the best electrical construction company in our field. We are experienced, responsive, competitive and on schedule. These qualities translate into excellence and trust. We believe in doing things right from the word go or we don’t do it at all. We strive to guarantee our long term commitment to a demanding customer base.